Canopy: An experience for thrill-seekers. 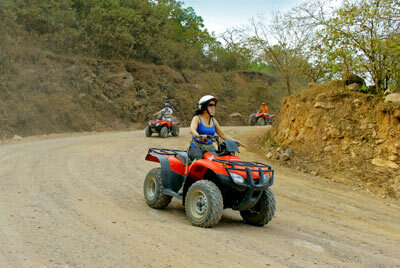 During your next trip to Puerto Vallarta you'll find plenty of recreational activities and tours. Whether you're preparing a family vacation in Puerto Vallarta, a weekend at one of the luxury hotels in Punta Mita, or a getaway at a romantic hotel in Nuevo Vallarta, there's something here for all tastes and budgets. While you're in Puerto Vallarta you'll come across plenty of adventure and water activities, excellent golf courses, dolphin swim programs, nature parks, tours around the city, cultural days out, sport fishing, and much more. If you're heading to Puerto Vallarta with children you can try one of the adventurous excursions on the beach, enjoy a zip line tour over the Cuale river, or experience swimming with dolphins in Vallarta. The dolphin encounter is a wonderful activity that teaches your kids about these playful creatures. If you're planning a romantic vacation in Puerto Vallarta, then you'll love the boat tours in Banderas Bay, the tours on horseback in Puerto Vallarta, and the shopping tours of the city. When you're thinking of spoiling yourself with a stay at one of the luxury hotels in Puerto Vallarta, don't forget to enjoy a relaxing round of golf in Vallarta or an exciting All Terrain Vehicle tour. The more adventurous can sign up for an expedition to the Sierra Madre mountain range for an exciting day out or an expedition to San Sebastian, a charming town hidden in the heart of the Sierra Madre. Banderas Bay awaits lovers of sport fishing in Puerto Vallarta with open arms and a treasure haul made up of red snapper, sea bass, tuna, swordfish, and other species. Spend a couple of hours or even a full day enjoying this exciting sport in a stunning setting. Finally, don't forget to head below the waves of the Pacific Ocean to discover the impressive underwater world hidden off the beaches in Puerto Vallarta. If you've never been scuba diving before, the best thing for you would be a scuba diving for beginners tour in Las Caletas. If you're already an expert, then check out the scuba diving for certificated divers in Islas Marietas. Your next vacation in Puerto Vallarta will be one filled with fun, excitement, and beautiful landscapes. Experience incredible days out in Puerto Vallarta and have a fantastic time at any time of year!